While the guests are eating Mary goes to the couch where Jesus is reclining, she breaks the box and pours its contents of expensive perfume upon Jesus' head and feet. IMON THE LEPER was a friend of Jesus. He lived in the village of Bethany, not far from the home of Martha, Mary, and their brother Lazarus. But "Simon the leper" was no longer a leper, for Jesus had made him well of that disease. And once more he could live in his own home with his family, in Bethany. No wonder Simon was a friend of Jesus! News reached the village folk of Bethany that Jesus and his disciples were coming over the road from Jericho and would soon arrive. Glad news this was to the friends who loved him so dearly, and they began to plan at once how they might give him a welcome. "Simon the leper" arranged to make a supper at his home for the tired guests, and Martha, the sister of Lazarus, went to help prepare and serve the evening meal. Simon invited Lazarus to eat with the other guests at the table; for since he had risen from the grave, Lazarus was looked upon with much wonder by the people. Mary also knew about the supper. At last the guests arrived, and they were welcomed at the home of Simon. Then the food was placed on the table and the guests were brought into the dining-hall to eat. Curious onlookers crowded in, for news of this supper had quickly spread through the village, and even as far as Jerusalem. And uninvited folk had come, not only to see Jesus, but to see Lazarus also, whom Jesus had called out of the grave after he had been dead four days. While the guests were eating, presently Mary arrived with a box in her hand. Going directly to the couch where Jesus was reclining, she broke the box and poured its contents upon Jesus' head and feet. Now this box had contained some very rare perfume, which had cost much money, and Mary had poured it all upon the body of Jesus to show her love for him. Then she bend low and wiped the feet of Jesus with her long hair. Just as soon as the box was broken the odor of the sweet perfume filled the room. And every one present knew this perfume had cost much money, for it was of the very best kind. At once the disciples began to whisper among themselves about what Mary had done. One of them, Judas Iscariot,who carried the money-bag for Jesus and the other disciples, became angry and said, "What a waste of money this foolish woman has made! Instead of pouring it all upon Jesus she might have given that money to buy food for the poor." Jesus knew the thoughts and whisperings of his disciples. He saw them question Mary about her deed, and speak unkindly to her. So he spoke to them all and said, "Let this woman alone. Why do you trouble her? She has done a good work, for she has come before my death to anoint my body with sweet perfume. The poor you have with you always, but I shall not be with you much longer. And by this deed Mary has shown her love for me." And Jesus said also that wherever the gospel should be preached in the whole world this deed which Mary had done to show her love should be told in memory of her. Perhaps Mary understood what the disciples were unable to believe--that Jesus soon must die--for she had sat at his feet and listened to his words while he visited in her home. She had heard him tell about many things, and she had believed them. And now she had poured out the costliest gift her money could buy, to anoint Jesus before he should have to lie cold in death. She had done all she could to show how great was her love. Judas Iscariot was even more displeased when he heard Jesus' words. He was no longer a true disciple, for he had allowed Satan to plant wrong desires in his heart. And sometimes he took money from the bag to keep for himself, for he loved riches and he had hoped some day to be a rich ruler in the kingdom he expected Jesus to set up. Now a wicked thought crept into his heart, and he planned to go as soon as possible to the enemies of Jesus in Jerusalem and promise them to give Jesus into their power if they would give him money for his work. 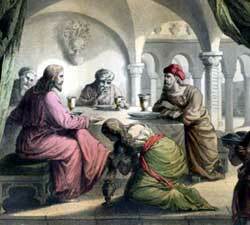 So after the supper was ended he left Bethany and went to see the chief priests and scribes who lived in Jerusalem. For many days the enemies of Jesus had been talking together about how they might capture Jesus. After Lazarus had been raised from the dead they were stirred more than ever, because many other people had begun to believe in Jesus, too. When Judas Iscariot came to them they were glad, and they promised to give him thirty pieces of silver money if he would bring them to Jesus when the multitude of believing friends were not near.